I get email frequently asking about the viability of making money with affiliate programs. The short answer is yes, affiliate programs can be a great way to make money. However, like any other income opportunity in life, your success depends on you and how well you manage your affiliate marketing business. Despite what some people say, affiliate marketing isn’t automatic, fast or one-click for cash. Instead, affiliate marketing involves picking a profitable niche topic, signing up for quality affiliate programs that help people in that niche, and promoting the programs effectively and regularly. 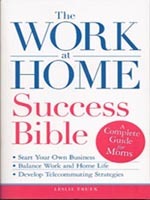 Did you know working at home is a good niche? Did you know Work-At-Home Success has an affiliate program through which you can make money helping others find their work-at-home path? Why should you consider the WAHS affiliate program? 1) The products are affordable (about the price of a pizza), so they’re easier to sell to work-at-home wannabes, many of whom don’t have a lot of money to spare. 2) It pays 65% commission. I give away most of the commission because I figure if you’ve made the sale, you deserve it. 3) Currently there are 9 products to choose from, allowing you to pick products that best fit your niche market. 4) All affiliates get a manual and tools to help them develop a marketing plan and promote the products. The manual includes an outline of all products so you know what you’re promoting, plus marketing tools such as graphics. 5) I encourage all affiliates to test out any or all of the products and am completely okay with your buying them through your own affiliate link. Many affiliate managers don’t allow this, preferring you to buy the product at full price to test it out. But I figure if you’re going to sell it, you’ll do better by trying it out, so why not get a discount? 1. Become a ClickBank affiliate (the WAHS program is run through ClickBank). It’s free. 2. 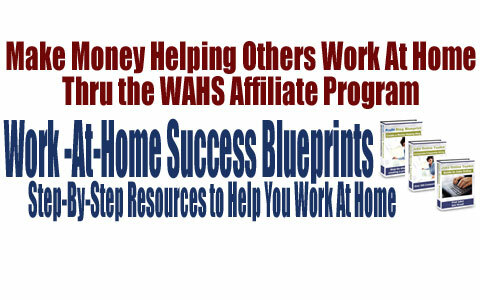 Visit Sign up for the WAHS program using your ClickBank ID. 3. Confirm the email subscription to the WAHS Affiliate program list to get your manual and tips to getting started. 4. Visit your affiliate dashboard to get affiliate links (you get information about this in the manual, as well) or visit Work-At-Home Success Blueprints and click the “Login” link. You’ll be able to get the manual and see stats. Your stats are also tracked through ClickBank. 5. Share your affiliate links on your blog, newsletter, social media and however else you want to promote them. Make Money Helping Others Work At Home!